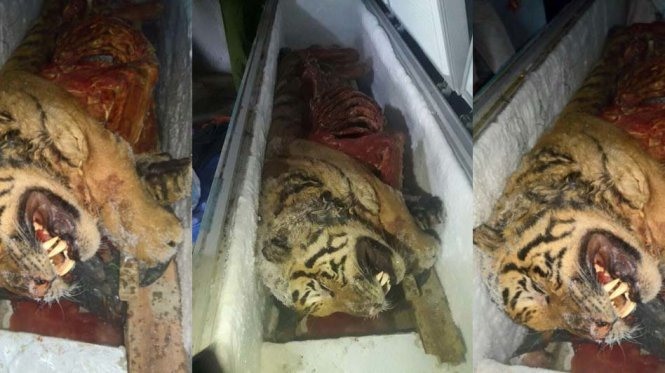 The local police of central Nghe An Province have seized five frozen tigers after conducting a raid on a resident’s house in Dien Chau District on Monday. The frozen tigers are found in Nghe An Province on Monday. The tigers are alleged to be Indochinese tigers (Panthera tigris corbetti), weighing some 100-150kg each, without internal organs. The police are investigating the case. Individuals and organisations are banned from hunting, transporting, slaughtering, raising and trading Indochinese tigers and products made from the tigers in accordance with the Government’s Decision No 160/2013/NĐ-CP and the Convention on International Trade in Endangered Species of Wild Fauna and Flora. All violations will be strictly penalised under regulations. According to experts, currently, Viet Nam only has some 30 tigers living in the wild.